Two medical marijuana state governors, Rhode Island Gov. Lincoln Chafee and Washington Gov. Christine Gregoire, on Wednesday called on the federal government to reschedule marijuana. In a joint 106-page petition to the DEA, they said states that have passed medical marijuana laws need to be able to regulate its distribution without fear of federal prosecution. Two governors of medical marijuana states, Gov. Lincoln Chafee (I) and Washington Gov. Christine Gregoire (D) Wednesday called on the federal government to reschedule marijuana. In a joint 106-page petition  to DEA head Michele Leonhart, they said marijuana needs to be classified as a drug with accepted medical uses so that states that have passed medical marijuana laws can regulate its distribution without fear of federal prosecution. They seem to want to get the word out too -- at the time of this writing, both governors' home pages link to press releases about the petition. The two governors speak from personal experience. Chafee brought his state's plan to open distribution centers to a screeching halt in September, citing fears the state-regulated dispensaries would become the targets of federal enforcement actions. And this spring, Gregoire vetoed key portions of a bill that would have set up a regulated dispensary system in Washington for similar reasons. The governors asked the DEA to move marijuana from Schedule I of the Controlled Substances Act , which is reserved for drugs with no accepted medical use and a high potential for abuse, to Schedule II, which includes drugs with a high potential for abuse, but with accepted medical uses. If moved to Schedule II, marijuana would be grouped with opioid pain relievers such as morphine, Dilaudid, and Fentanyl; prescription amphetamines and methamphetamines, such as Dexedrine and Desoxyn; barbiturates, and cocaine. Moving marijuana to Schedule II would allow it to be prescribed by doctors (medical marijuana states currently have laws specifying a doctor's recommendation -- not a prescription -- to get around DEA threats to doctors who would prescribe medical marijuana) and stocked in pharmacies, as well as sold in dispensaries, as it currently is. The federal government has repeatedly refused to reschedule marijuana over the past 20 years. Most recently, in July, the DEA denied a rescheduling petition  brought by the Coalition for Rescheduling Cannabis . That denial is being appealed. In denying the petition, the DEA steadfastly maintained that: "Marijuana continues to meet the criteria for Schedule I control under the CSA because marijuana has a high potential for abuse, marijuana has no currently accepted medical use in treatment in the United States, and marijuana lacks accepted safety for use under medical supervision." It is time for the DEA and the Food and Drug Administration to change their tunes, the governors said. "The divergence in state and federal law creates a situation where there is no regulated and safe system to supply legitimate patients who may need medical cannabis," they told Leonhart. Their petition includes a substantive science-based report that has been peer reviewed and cites more than 700 independent references, many of which are new science since 2006. It details non-smoking methods, and describes how recent scientific developments like affordable DNA analysis supports the pharmacy model. With modern DNA analysis, the plant's beneficial compounds can be determined, and with current technology readily available today, a compounding pharmacist could easily and inexpensively quantify the levels of cannabinoids, and then use the appropriate cannabis blend to create a customized medication for an individual patient. "Poll after poll shows an overwhelming majority of Americans now see medical marijuana as legitimate," Gregoire said. "Sixty percent of voters in our state said yes on a 1998 ballot measure. An ever-growing number of doctors now tell thousands of suffering patients they may find relief from the unique medicinal qualities of cannabis. There is simply no question that pharmacists could safely and reliably dispense cannabis to patients -- just as they do for other controlled and more problematic drugs." "Americans' attitudes toward medically prescribed marijuana are changing, and medical organizations throughout the country -- including the Rhode Island Medical Society and the American Medical Association -- have come to recognize the potential benefits of marijuana for medical use," Gov. Chafee said. "Patients across Rhode Island and across the United States, many of whom are in tremendous pain, stand to experience some relief. Gov. Gregoire and I are taking this step to urge the federal government to consider allowing the safe, reliable, regulated use of marijuana for patients who are suffering." "Sadly, patients must find their way along unfamiliar, uncertain paths to get what their doctors tell them would help -- medical cannabis to relieve their suffering," Gregoire said. "People weak and sick with cancer, multiple sclerosis, and other diseases and conditions suddenly feel like -- or in fact become -- law breakers. In the year 2011, why can't medical cannabis be prescribed by a physician and filled at the drug store just like any other medication? The answer is surprisingly simple. It can. 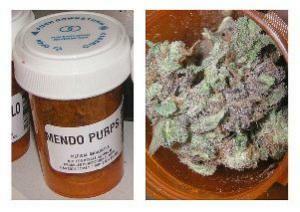 But only if the federal government stops classifying marijuana as unsuitable for medical treatment." Gregoire added that two years ago, the American Medical Association reversed its position and now supports investigation and clinical research of cannabis for medicinal use. And The American College of Physicians recently expressed similar support. Both the Washington State Medical Association and the Washington State Pharmacy support reclassification, as do the Rhode Island Medical Society and other state medical associations. Medical marijuana advocates reacted with elation to the governors' petition.But they also pointed out that we still have a long way to go. "This is groundbreaking," said Kris Hermes, spokesman for Americans for Safe Access  (ASA), the country's largest medical marijuana advocacy group. "To have two governors in a bipartisan move from states on opposite sides of the country with medical marijuana laws that are in jeopardy because of federal actions announcing that they want to see the federal government reclassify marijuana is a big deal indeed." But it doesn't mean it's okay for them to hold up their own state medical marijuana programs, said Drug Policy Alliance  head Ethan Nadelmann. "The governors' call for rescheduling marijuana so that it can be prescribed for medical purposes is an important step forward in challenging the federal government's intransigence in this area," said Nadelmann. "But their call should not serve as an excuse for these two governors to fail to move forward on responsible regulation of medical marijuana in their own states. Governors in states ranging from New Jersey and Vermont to Colorado and New Mexico have not allowed the federal government’s ban on medical marijuana to prevent them from approving and implementing statewide regulation of medical marijuana. Govs. 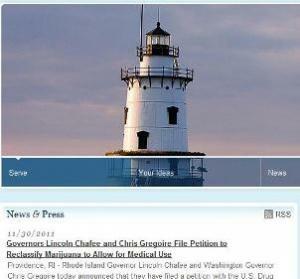 Gregoire and Chafee should do likewise." Similarly, the Marijuana Policy Project  (MPP) also had a "mixed reaction" to the news, chiding the governors for not standing up more forcefully for patients. ASA is part of the coalition that is appealing the DEA decision in July not to reschedule marijuana. "This is something we're currently embroiled in, and we will continue to fight vigorously for the federal government to reschedule marijuana on our end and the governors' end as well," Hermes said. "We applaud the leadership of the governors in urging the Obama administration to reclassify," he reiterated. "With the help of these governors and hopefully more, it's only a matter of time until marijuana is rescheduled."